Milford Sound is a place I will never forget. I was among the the lucky few that got to live and work in Milford Sound on a permanent basis. Most people have to travel in and out of this beautiful place each day. But, I was working as a sea kayak guide for Rosco’s Milford Sea Kayaks. And that meant that I was aloud to stay. Working as a Sea kayak guide can be hard work. There are long days, high winds and storms to deal with. You may also have to tow clients in a double sea kayak several kilometers. You will get wet, cold, dehydrated and sun-burnt. I often got up and started work at 6am and didn’t finish until 10pm (with a couple hours rest in the middle). Its not a life for everyone. But it’s worth it when everyday I’m living in a place I loved, surrounded by awesome, like minded friends who turned into my family here and more than that, it was simply great fun! Those who choose to work as a sea kayak guide will often find themselves living in rural areas. This is because, quite often, the best coastal scenery is located in rural areas. Clients don’t want to go kayaking on a polluted urban coastline, they want the beautiful and untouched coastline. For me, this is defiantly a highlight of being a sea kayak guide – I get to work in remote and beautiful places. 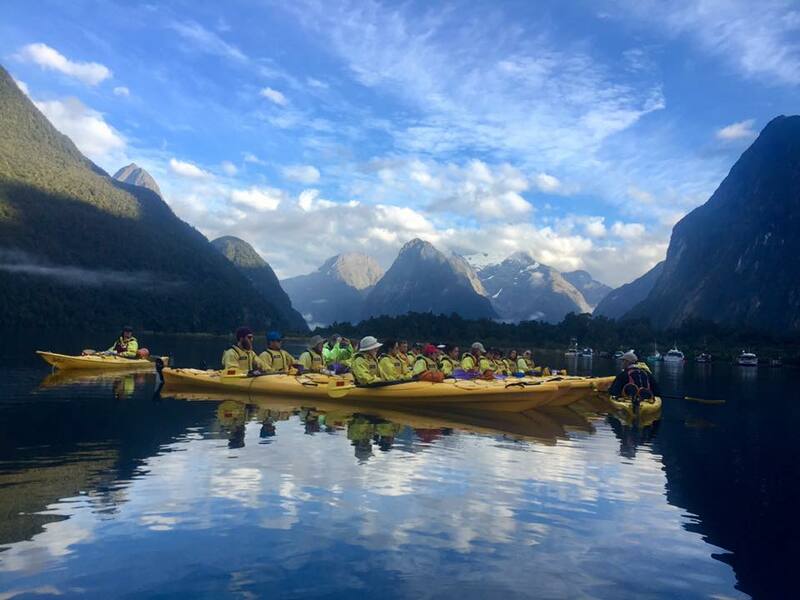 The scenery was by far the best thing about living and working as a sea kayak guide in Milford Sound. Looking down Milford Sound. Sinbad Cove and Mitre Peak on the left. Harrison Cove & Mt Pembroke on the right. The fiord is surrounded by towering mountain peaks, thousands of meters high that almost blot out the sky. They are some of the oldest mountains in the world too. They are made of granite that has been eroded away by glaciers over thousands of years. The result of this erosion has left mountain walls are pure vertical cliff faces that stretch out into the sky. Where the walls meet the sea they keep plunging straight down, no one is quite sure how deep some of the sections are! There are stunning ‘hanging u-shaped valleys’ jutting out of the cliff faces too. They all have waterfalls pouring out of their mouths. 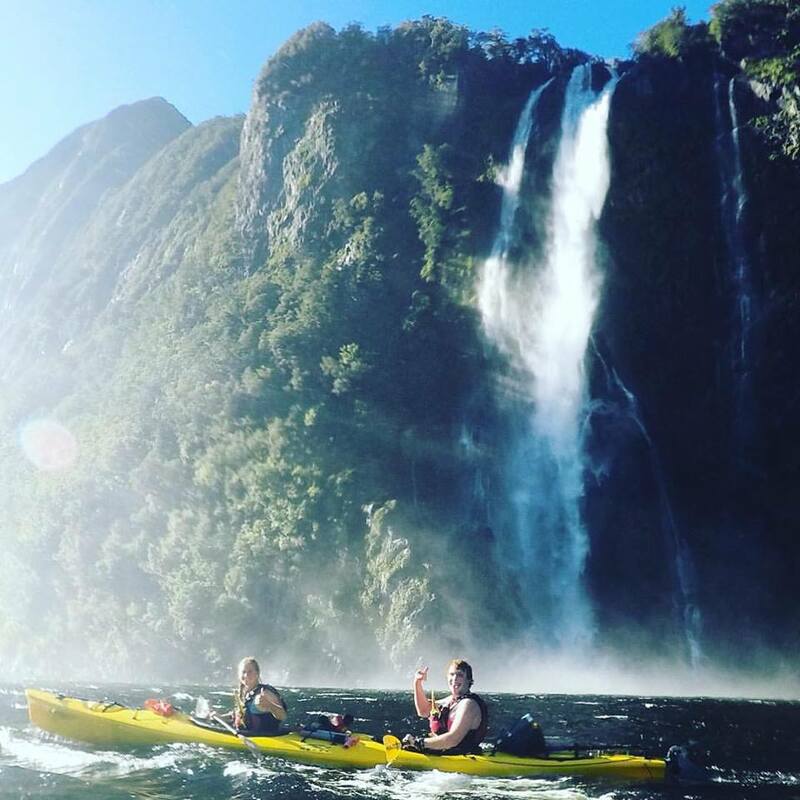 We could even kayak under some of them, the largest of which is Stirling falls at 151m tall! Taking out tops off to go under Stirling Falls! These iconic mountains are a wonder to behold. Getting up at 6am was often my favorite time. Paddling out into the darkness, the water would be flat as a mirror. Slowly, a glistening gold appears on each mountain tip as the sun bathes the mountains in an Alpine Glow. The gold creeps down the mountain faces until the whole fiord is full of colour! Milford Sound’s is also the 13th wettest place in the world. The vast expanse of the Southern Ocean that suddenly meets towering mountains creates an believable amount of run off rain. I remember one day when it rained 350 mm in only 24 hours! That’s over a 3rd of a meter – IN A DAY! Steep mountains made out of the non-porous granite means only one thing: waterfalls! As a result, on a wet day in Milford, you can see more waterfalls in one day than you will have seen in a single year. It is a purely stunning experience. No matter what the weather is, Milford Sound will blow you away and keep on surprising. Don’t get me wrong. There are plenty of beautiful days of clear blue skies and crystal clear water. But that can be found anywhere. The sheer amount of rainfall that is dropped in Milford Sound cannot. Encountering and interacting with wildlife is always an exciting bonus when working as a sea kayak guide. Being in a kayak allows you to get closer and get into places where other larger boats can’t. Milford Sound was amazing because of the diversity and spectacular nature of the wildlife you can to encounter. The classic animals to see are the kereru (wood pigeon), ducks of paradise, and the dreaded Te Namu (sand fly with a nasty bite). If you head further out into the fiord there are plenty of New Zealand fur seals too. As a sea kayak guide you get paddle right up close and take the clients too. The fur seals are not phased by a group of bright yellow sea kayaks. I always loved being able to get up close to these guys. They are always playful and full of fight of each other. My Best Experience Working as a Sea Kayak Guide. It wasn’t just seals and birds though. 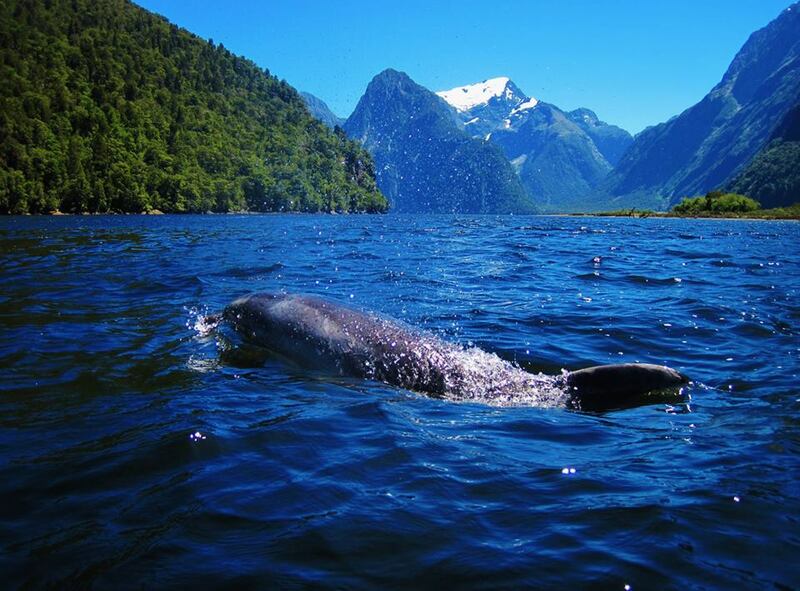 Milford Sound is also home to a group of dolphins who feed off the supply of numerous fish that lurk in the depths. These playful but shy characters are often spotted and the ultimate highlight is when they chose to come and swim with us. My best memory with them is kayaking with a group of clients and all of a sudden there is an adult dolphin beside me and it’s calf on the other side. They stayed with us for about 5 minutes just drifting along beside us as we paddled. It was so surreal and my client in the front of my boat even cried! I always advise people not to struggle for cameras when the animals of Milford Sound appear but instead, just enjoy the moment. Really live in it and take it in, let it become a lifelong memory rather than a snapshot. You also have to keep up with dolphins. If you stop to take a picture then both the dolphins and the moment will be gone! In Milford Sound these go hand in hand. The remoteness meant that every time you went outside was an adventure. On days off I’d go whitewater kayaking and or climbing some of the mountains. On work days, I’d spend hours in a kayak and paddle dozens of kilometers. Being adventurous meant that I was healthy. I was working my body to extremes and getting fitter and healthier all the time. My health was not even a focus, it was just a benefit. Obviously working as a sea kayak guide is an active job. Lifting the kayaks onto boats and down the ramp to the water. Paddling the kayak yourself and then the dreaded time that you have to tow a client. Without meaning to, I became the fittest and strongest I have ever been. I felt great! At my peak I ran two 20 km kayak trips and then went out whitewater kayaking after. I was pretty much active between 6:30 am and 11pm at night, having sea kayaked 40 km, hiked and whitewater kayaked all in a single day! When you live in a place that encourages you to get outside, it’s hard to say no! Working as a sea kayak guide was one of the best things I did for my health. Both mentally and physically. I was getting outside everyday, experiencing the amazement of Milford Sound and shearing it with clients. The sun kept the vitamin D levels high and me feeling happy. I got so much exercise working as a sea kayak guide and so I’d highly recommend it to anyone who loves water adventures like I do. Do you fancy working as a sea kayak guide? I loved working as a sea kayak guide. It allowed me to see the world in a different light. I got excited about the weather and how the clouds formed. I was always eager to interact with the animals and take clients headfirst under the waterfalls. Becoming a sea kayak guide improved my overall fitness and health. Plus it was hella fun! I’d highly recommend anyone who has the chance to give it a go. I am happy to help anyone who is looking to become a sea kayak guide. Send me a message in the contact form and I’ll be able to give you some helpful tips and advice!